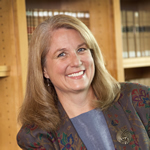 Sandy Placzek is Associate Director and Professor of Law Library at the Schmid Law Library, University of Nebraska College of Law, where she has worked since 1998. She received her B.A. from the University of Nebraska-Lincoln, her J.D. from Creighton University School of Law, and a Masters in Library and Information Science from the University of Texas-Austin. Before coming to Nebraska, Sandy worked as the Acquisitions/Reference Librarian at the Drake University Law Library.